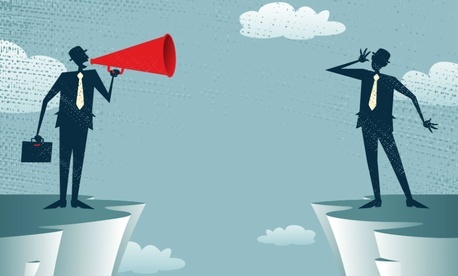 Employee satisfaction with communication from agency leaders has declined steadily in the past four years, the nonprofit Partnership for Public Service reported on Wednesday. Sixty percent of agencies for which data are available registered a decrease in satisfaction with leadership communication from 2009 to 2013, with the governmentwide index score for satisfaction falling 3.9 points to 50.2 out of 100, according to the group’s new analysis of responses to three questions on the 2013 Federal Employee Viewpoint Survey. On the question of satisfaction with information from managers about what is going on within agencies, the governmentwide score sunk to 44.8 percent positive. That compares with 60 percent satisfaction rates in the private sector, according to the Hay Group. 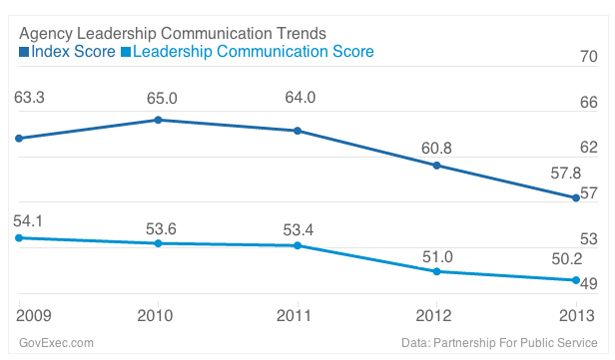 The governmentwide score on whether leaders communicate on goals and projects with different agency units dropped from 54.5 in 2009 to 48.2 in 2013, the study found. Managers rated the highest in the category of communicating the goals and priorities of the organization, with a governmentwide score of 57.5 in 2013, down from 59.7 in 2009. 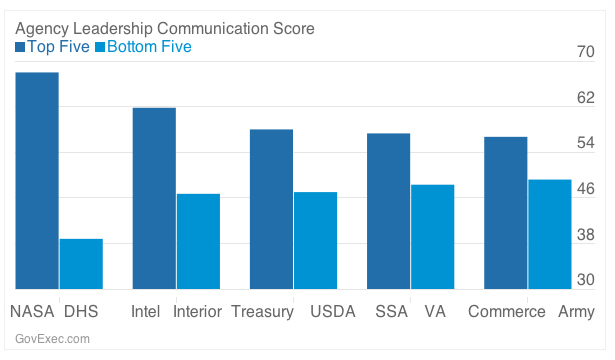 The top-ranked agencies in communications by leaders for 2013 were NASA, the Intelligence Community and the Treasury Department. The worst communicators were the Homeland Security, Interior and Agriculture departments.